Background: Developing group of recent findings demonstrate that serotonin receptors play a significant pathophysiological role in major depressive disorder (MDD). Objective: This article will briefly review the literature concerning mechanisms of action, brain distribution and localization of 5HT receptor subtypes and their changes in patients with MDD, as reported via neuroimaging, postmortem and genetic studies. Method: Postmortem brain researches, neuroimaging PET studies and genetic polymorphism studies in suicide and depression were examined in order to explore the role of 5-HT receptor subtypes in the neurobiology of major depression as possibly beneficial biomarkers for diagnosis and treatment response in MDD. 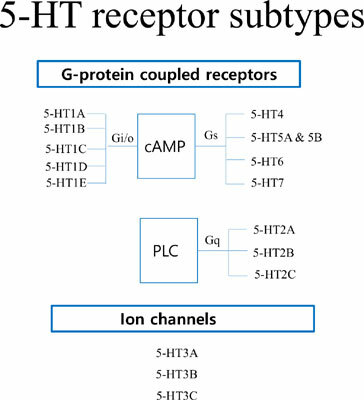 Results: Reported significant association between Gene polymorphisms of 5-HT receptors including 5-HT1A, 5-HT1B, 5-HT3, 5HT4 and 5HT6 and diagnosis and treatment response in depression suggests these serotonin receptor subtypes as important therapeutic and diagnostic markers for depression. Neuroimaging studies by PET revealed a higher rostrally and lower caudally binding potential of 5-HT1A receptor in the dorsal raphe nucleus in patients with suicidal depression, decreased potential binding of 5-HT1B receptor and elevated binding potential of cortical 5-HT2A receptors. Postmortem studies reported an elevated abundance of 5-HT2A receptors in the prefrontal cortex, altered mRNA encoding editing of 5-HT2C receptors in the prefrontal cortex and higher levels of 5HT4 receptor binding in frontal cortex and caudate nucleus of depressed suicide victims. Conclusion: 5-HT receptors including 5-HT1A, 5-HT1B, 5-HT2A, 5-HT2C, 5-HT3, 5-HT4 and 5- HT6 are involved in the neurobiology of major depression and might be beneficial biomarkers for diagnosis and treatment response in MDD and will help the development of future treatments. Serotonin receptors, major depression, neuroimaging, postmortem brain, genetic investigations, 5-HT receptors.